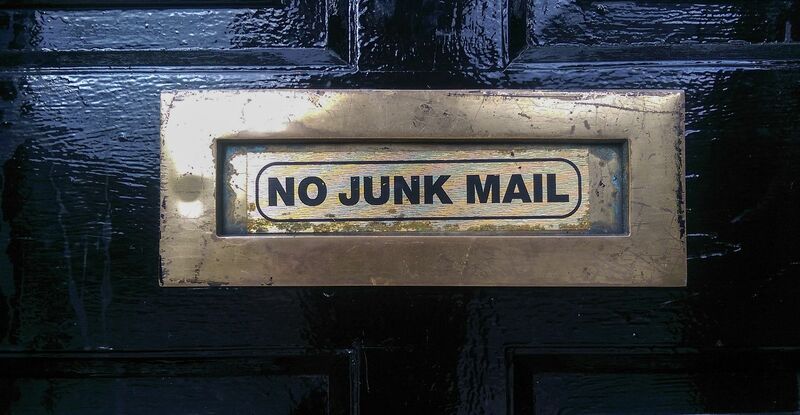 Has there ever been – could there ever be – a message more useless than the NO JUNK MAIL stickers that you seem to see stuck on or around more and more letterboxes? And not just useless, but silly, prissy and naive too. Naive because most junk mail is of course pushed through letterboxes by postmen, and it’s just inconceivable that a postie would scrutinise every envelope, decide whether it’s junk mail and then…well, then what, exactly? Then not put it through your letterbox and do what with it? Take it back to the sorting office? Return it to sender? Put it in a bin? Third, these stupid sticker-stickers don’t seem to realise that the Royal Mail’s contract isn’t with them, it’s with the customers paying for them to deliver things. If postpeople were deflected from fulfilling this contract by a front-door sticker, the Royal Mail’s contract business would collapse into chaos. And, of course, long before than, your kind, helpful, sticker-reading, envelope-perusing postie would have lost his or her job. Similar considerations apply to non-Royal Mail deliveries. You have 500 restaurant menus to post through letterboxes before you can collect your four hours’ money on minimum wage. Apart from the fact that you’ll certainly be sacked if a stack of them are found in a bin somewhere on your delivery round, how keen are you to politely desist from posting a leaflet whenever you see a NO JUNK MAIL sign? Not keen at all, 100% unkeen, is the answer. There are four of these useless stickers in my street alone, and there must be hundreds of thousands across the country. They can’t possibly achieve any part of their aim, so what’s the point of them? I think they’re there, as most communication is, to say something about the communicator rather than something to the communicatee. 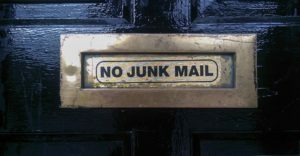 In their abrupt rejection of JUNK MAIL, they say the residents aren’t taken in. In the same way that research focus group respondents smugly tell us how utterly they remain unaffected by advertising, NO JUNK MAIL:people choose their restaurants on the basis of the review in the Good Food Guide, unbiased recommendations on social media and personal, objective experience, not on fliers pushed through the door offering freed delivery on orders of £20 or more.. NO JUNK MAIL signs are a sort of virtue signalling, although somehow that isn’t quite the right phrase – I’d be grateful if you could suggest a better one. And one final thing – they’re ugly, too. From the point of view of passers-by, rather uglier than the mail inside, lying on the doormat. Robo advice. Still happening, still a stupid name, still a mystery. Looking back at entries in this blog written before the Great Suspension (i.e.before April 2016) I’m surprised how many of them are about robo advice. This is a subject that still feels like fairly new news to me, or at least like a fairly new (as well as stupid) name. But in fact I was grumbling about the stupidity of the name back in late 2015, and expressing major doubts about the viability of the whole concept at the same time. The viability doubts all focused, one way or another, on a single issue: are we sure there are enough consumers out there who are keen to engage with services like these? As I’ve said a million times, there is certainly a small number of enthusiastic investment “hobbyists,” who love everything to do with investing and make up the bulk of the customer bases of most established D2C investment services (particularly Hargreaves Lansdown). But is it the case that just below them in the pyramid there are a few million potential investors, ready to become more engaged and active if only they could find a nice, simple, accessible service which they felt comfortable with? There is undoubtedly a “next level down” more or less like this in a great many markets, and welcoming them in with that nice, simple accessible new option can be a very successful and profitable thing to do. I could argue that in (fairly) recent years this has been the secret of the success of car manufacturers with “hot hatchbacks” from the Golf GTi onwards; of the “casual dining” sector with restaurant brands including Cafe Rouge, Frankie & Benny’s, Carluccio’s and Nando’s, among dozens of others; and in a slightly different way of the game-changing success of low-cost airlines like easyJet, Ryanair and Norwegian. But is it true in investment? Of course the “next level down” investment brands will pick up some business from curious, promiscuous hobbyists, just as my automotive, restaurant and airline examples have done. But that’s not how you make the big money – you make the big money when you find the formula that expands the market. In robo advice, I’ve never believed that any of the existing players has come up with a propositiion anything like simple enough, a brand anything like appealing enough or a marketing budget anything like big enough to become the GTi, Cafe Rouge or easyJet of the sector. It seems that quite a few of the existing players share my doubts, because one thing that has been happening while I’ve been away is that a number have been partnering with, or indeed being acquired by, big institutions who, it’s believed, can give them access to millions of warm customers and wonderfully nice low cost. This blog, indeed, has been triggered by an announcement of another of these partnerships, with the oddly-named Scalable Capital partnering in some sort of way with Dutch bank ING. (Is it just me, or is there something a bit troublingly reptilian about that “Scalable”?) Blackrock already owns a big slice of Scalable, and of course Aviva has bought Wealthify, LV= owns Wealth Wizards and Schroders has invested a lot of money into Nutmeg. To be honest, I can’t actually remember if we develop this theme in our forthcoming book on financial services marketing, No Small Change, written jointly by my old friend Anthony Thomson and myself and due for publication in the last week of May. All I can say is that there may well be. I’ll give you the pre-ordering details as soon as I have them,. and you can find out for yourself..